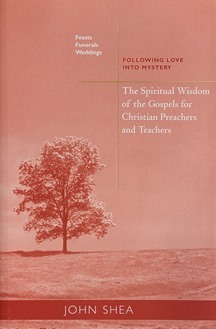 Wisdom, wit, and Sacred Writ are the outstanding interactive hallmarks of this fourth and final volume in The Spiritual Wisdom of the Gospels for Christian Preachers and Teachers series. In the same style and format as the first three volumes, Shea presents evocative reflections to enhance Scripture-based preaching and teaching for liturgical feast days, funerals, and weddings. Christian preachers and teachers and anyone interested in the spiritual life will find Feasts, Funerals, and Weddings an insightful and relevant resource. John Shea, STD, is a theologian, author, and storyteller who lectures nationally and internationally on storytelling in world religions, faith-based healthcare, contemporary spirituality, and the spirit at work movement. This is an invaluable commentary. John Shea breaks open the word of God in extraordinary ways. It is rare that one of his reflections doesn't contain a stunning new insight. He draws upon the best studies in Scripture but also upon spiritual wisdom as it is found in literature, poetry, psychology, and other religious traditions. He makes all the deep connections and has worked for years in honing a language that is [so] direct, it stares you in the eye. Anyone preaching or teaching on the Gospels will be helped by this commentary. I have shamelessly borrowed insights from him and if I were down to just one commentary on the liturgical readings it would be this one. This is the fourth and final volume of a series on the lectionary that is intended to provide food for thought and preaching. Shea is a nationally known spiritual guide whose writing is at once inspiring and provocative. In this volume he provides commentary on the readings for major festivals (e.g., Christmas, Lent Easter, Pentecost) and for weddings and funerals. His method is not a verse-by-verse commentary on the biblical passages (although he draws on sound biblical interpretation) but meditative essays prompted by the readings. Preachers will find a lot of great homily leads here and so, too, will any reader seeking some good spiritual nourishment. John Shea's gospel insights are the very best! In an all too busy world with so many homily helps and Bible-based catechetical tools from which to choose, I chose John Shea's material and wisdom. In his weekly section of Spiritual Commentary or his section on Teaching, on more than one occasion I have caught myself saying, `why didn't I think of that!' His approach to the Gospels is brilliant. His teaching through the Gospel text makes common sense in a complicated world.